after having read The Ice Storm and Garden State many moons ago (the late 90s), I had lost track of Rick Moody. Not that he went anywhere. I even have a copy of Purple America that I have never read. But I just never found myself drawn back to him. 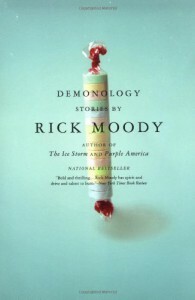 Recently I had to read Demonology for a class and also had the chance to meet Moody at a reading. I have fallen into his post-Ice Storm work with much enthusiasm. It doesn't always work ("Hawaiian Night" is conceptually interesting but almost too dense to figure out; "Wilkie Fahnstock" seems like one of those ideas that probably shouldn't have made it to the page), but when it does, I am enthralled ("Mansion on the Hill," "Forecast from the Retail Desk," "The Carnival Tradition," "Boys," and of course "Demonology." He's definitely not for everyone -- and I don't mean that in a "I'm smart enough to get it" way. If you can get through the misfires, the ones that hit, hit hard.